As widely reported worldwide, it was a false alarm, someone having pushed the wrong button in the civil defense headquarters. Due to bureaucratic bumbling, it took 38 minutes for authorities to notify the public that it was a mistake. During those 38 minutes, many residents and visitors who received the message reportedly suffered varying degrees of anxiety and panic attacks. The “fallout,” as reported by the media and more directly by some friends caught up in the drama, brought to mind the words of the French philosopher Michel de Montaigne: “They come and they go and they trot and they dance, and never a word about death. All well and good. Yet, when death does come – to them, their wives, their children, their friends – catching them unawares and unprepared, then what storms of passion overwhelm them, what cries, what fury, what despair!” In this case, death didn’t come, but many cries and furies were heard, even death threats made against the anonymous button pusher. The State of Hawaii went so far as to establish a Crisis Line for those unable to deal with the emotional distress and in need of counseling. All that is not to suggest that those who accept the reality of the survival of consciousness at death would not experience some degree of anxiety at the thought of being annihilated by a nuclear bomb or that they would simply say, “Bring it on!” It is to suggest, however, that such anxiety might be considerably mitigated by such a belief and that psychological counseling would not be necessary. The suggestion goes well beyond such a scenario, though, and extends to the way we grieve the deaths of our loved ones. As August Goforth points out in his recently released book, The Risen: A Companion to Grief, knowing that life continues beyond death makes all things bearable. The author of five other books, including The Man Who Could Fly, discussed in my October 23, 2017 post, Grosso taught humanities and philosophy at Marymount Manhattan College, City University of New York, and New Jersey City University and is affiliated with the Division of Perceptual Studies at the University of Virginia. Grosso notes that while there is an ever increasing abundance of research, coming to us from mediumship, near-death experiences, reincarnation studies, and deathbed phenomena, suggestive of postmortem survival, belief in an afterlife seems to be at an all-time low. This, he sees, as being the result, in great part, of practical materialism in everyday life leaving little space to encounter the transcendent. In earlier societies, before all the technological advances we have witnessed in recent decades, consciousness was much more permeable to alternate realities. As I read Grosso’s words, I imagined a scene from 1800s, before electronic distractions, in which the woman of the house was knitting and her husband whittling before a fireplace, both frequently staring into the flames and allowing spirit influence to permeate the consciousness and settle in the subconscious. “Brainwashed by mainstream scientistic materialism, we feel constrained by their ideas of what is possible,” Grosso continues. “Tied to constricted worldviews, we submit to the status quo, however soul-deadening. Faced with more idealistic possibilities, we respond with passive skepticism.” Materialism, he says, neglects the unseen dimension and serves to keep us distracted and unaware of the Transcendent. Leo Tolstoy’s classic story of Ivan Ilych is cited as perhaps a typical ending for many non-believers. A judge by profession, Ilych looked to pleasure, status and power as his gods, until his world began to crumble as he approached death and what he saw as an abyss of nothingness. The NDE, Grosso opines, is a “metaphysical paradigm-buster,” a phenomenon that points increasingly toward undermining the mechanistic universe subscribed to by mainstream science. In Chapter Five, he summarizes a number of NDEs, pointing out how the standard debunking theory of oxygen deprivation does not explain them. “Consciousness delocalized suggests the possibility of a prolonged or even permanent out-of-body experience – also known as the afterlife,” he writes, also telling of two of his own out-of-body experiences in which he found himself light, mobile, electric, and ecstatic, at the same time feeling angst over his concern about getting lost in mental space. Next blog post: Feb. 5. Researcher explains what the Spirit World is like! Between 1914 and 1917, William J. Crawford, D.Sc., studied the mediumship of Kathleen Goligher, a Belfast, Ireland medium. He reported on his findings in four separate books. This is the third and final part of my “interview” based on Crawford’s words from those books. The first two parts part can be seen in the last two posts here. The questions have been tailored to fit the comments. Dr. Crawford, I know that your focus was on the physical phenomena, but you seem to have communicated with the operators or spirits, quite often. Did they tell you much about themselves? So they are not much different than human beings? Have they told you anything about their living conditions? Have they mentioned spheres, levels, dimension, or planes as so many other communicators have? But have they told you what life is like in these spheres? It’s so hard to visualize all that in an etheric world. You refer to them as operators and entities, but some researchers suggest that it is some aspect of the subconscious that is manifesting and that it does not involve spirits of the dead. What do you say to that? Is time the same for them? Outside of the operators, are other spirits aware of what is going on in your experiments? Is there any indication that spirits are all around us? It is my understanding that there are times when nothing happens at Miss Goligher’s séances. Do you know why this is? So many of these physical mediums, such as Eusapia Palladino and Mina “Margery” Crandon, have been called frauds because the researchers believe they are using their arms or feet to move things. We are led to believe by more keen observers that it is really a “phantom arm” of some kind originating with the spirit world. Have you observed this with Miss Goligher? In spite of your efforts to be strictly scientific in your experiments and reports, you’ve received much negative criticism from the scientific world. Any thoughts on this? Between 1914 and 1917, William J. Crawford, D.Sc., studied the mediumship of Kathleen Goligher, a Belfast, Ireland medium. He reported on his findings in four separate books. This is the second part of a three-part “interview” based on Crawford’s words from those books. The first part can be seen in the last post here. The questions have been tailored to fit the comments. Crawford brought in a scale large enough to hold the medium while she was sitting in her chair. 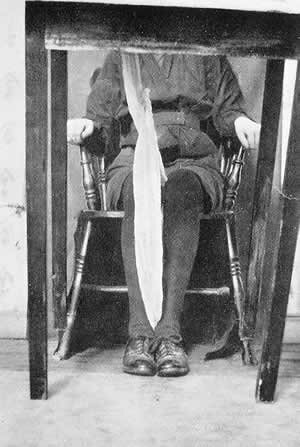 He discovered that when a table was being levitated, the weight of the table, usually around 16 pounds, was transferred to the medium through what he called “psychic rods” (ectoplasmic rods). Most of the time, the transfer of weight would be a few ounces short of the weight of the table. Further experimentation revealed that the extra weight was being transferred to the sitters in the room, who apparently furnished small amounts of the “psychic force.” My “interview” continues. Dr. Crawford, do these levitations happen frequently in Kathleen’s mediumship? Is that the extent of the phenomena? Some critics have a difficult time believing that spirits would be engaged in what seems to them as tomfoolery. As I understand it, they are experimenting, just as you are? What do you say to this? You mentioned observing all this under a red light. How strong is the light? According to Sir William Crookes, light did not seem to affect D. D. Home. I gather that the reason one cannot get directly in front of the medium has something to do with the psychic force flowing from her. But can that space be observed to be sure she is not using her feet or some other form of trickery? I know that Sir William Barrett, the physicist, was an observer. Have other outsiders been witness to it? I recall reading in one of your reports that the psychic energy gets stronger as the séance goes on. As I understand your reports, this psychic energy, psychic stuff, plasma. or ectoplasm, whatever name be given to it, is not really visible to the naked eye, but that you were able to feel it. Would you mind elaborating on that experience? Your books show photographs of ectoplasm. How did that come about? “Only [during the last six months or so of my investigation was it] possible to photograph the stuff which issues from the medium’s body. (I call it ‘plasma’ for want of any better word), and from which the psychic structures are built up that produce the phenomena of raps, levitations, touchings, etc. For about a year I took a photograph each séance night in the hope that success might ultimately be obtained. The operators informed me by raps that success would finally come if I would be persistent enough. The chief difficulty seemed to be in preventing injury to the medium. The operators said it was necessary gradually to work her up to withstand the shock of the flashlight upon the plasma; nor is this to be much wondered at when it is considered the plasma is part of her body exteriorized in space.